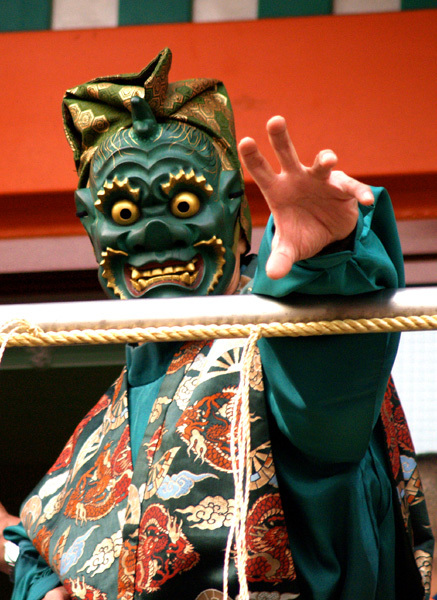 Setsubun ("seasonal division") is one of my favorite Japanese traditions. It's the day that Japanese seek to drive bad luck or evil out of their homes by throwing beans. The bad luck is personified as devils known as Oni. Oni apparently have an acute allergy to beans which causes them to go blind. 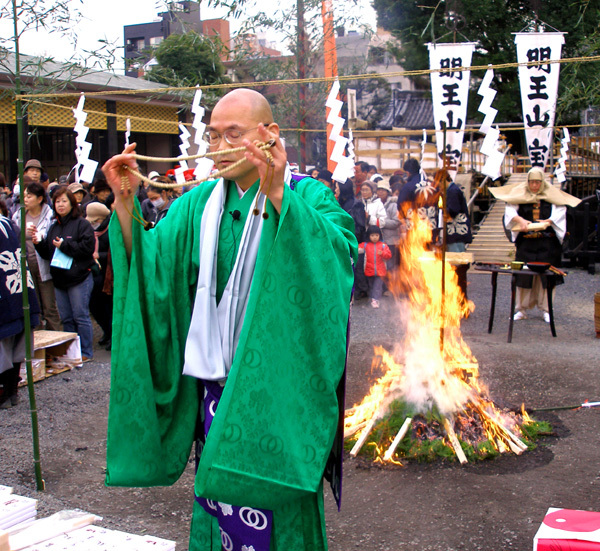 People throw beans and eat them to effectively ward off the evil of the dreaded Oni. 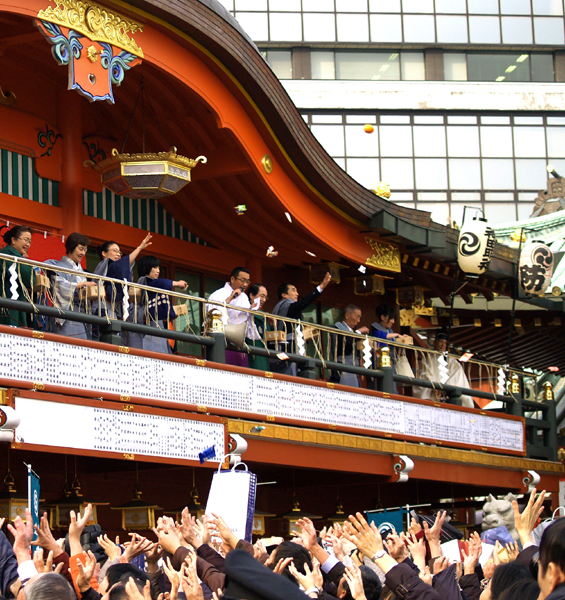 At temples and shrines, crowds gather to have beans thrown to them. This is known as mame-maki. Priests and local dignitaries sometimes celebrities will throw beans and other items which people try to catch for good luck. 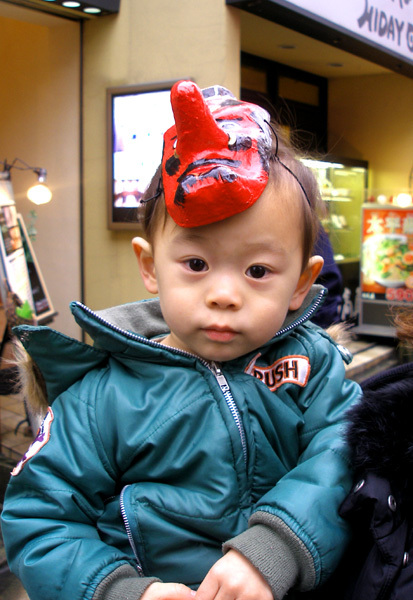 I've been going to temples and shrines in and around Tokyo for the last four or five years to celebrate Setsubun. I always take the day off if I am scheduled to work that day. 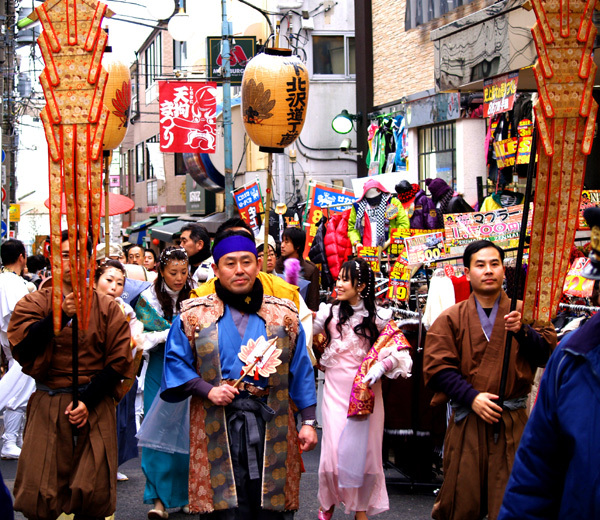 I usually try to hit two or three places for Setsubun festivities. 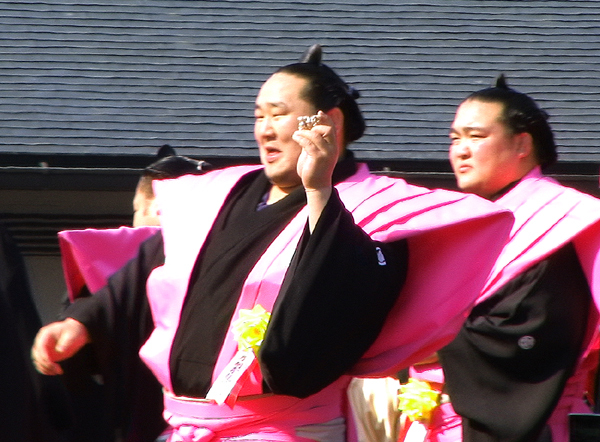 This year I was able to squeeze in four Setsubun ceremonies though I actually started my Setsubun a little early. On Jan. 31, I went to the small neighborhood of Shimokitazawa in western Tokyo. 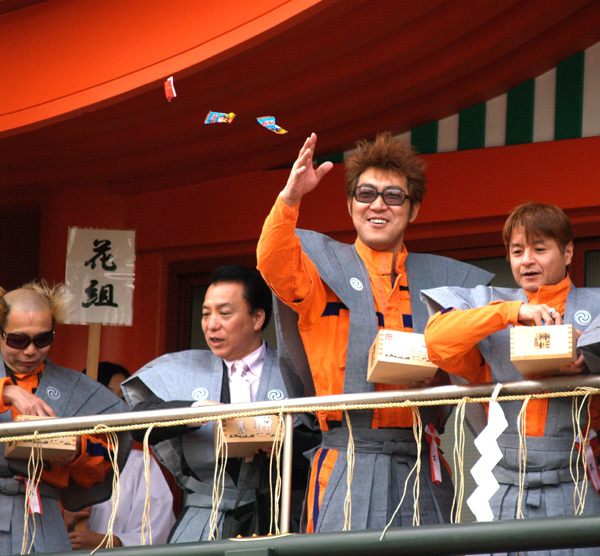 There they have their Setsubun celebration on the weekend before Setsubun (Setsubun is always Feb. 3). 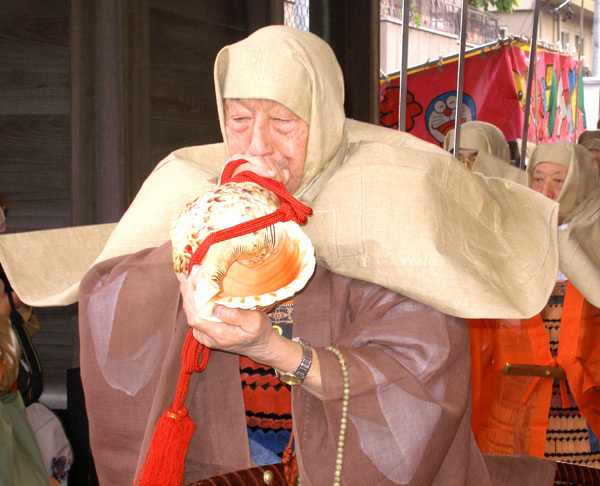 Leading the procession is long nose goblin known as Tengu. The Tengu is a mythical creature known for being both mischievous and kind. Some of them trained the hero Minamoto-no-Yoshitsune on Mt. Kurama near Kyoto almost a thousand years ago. 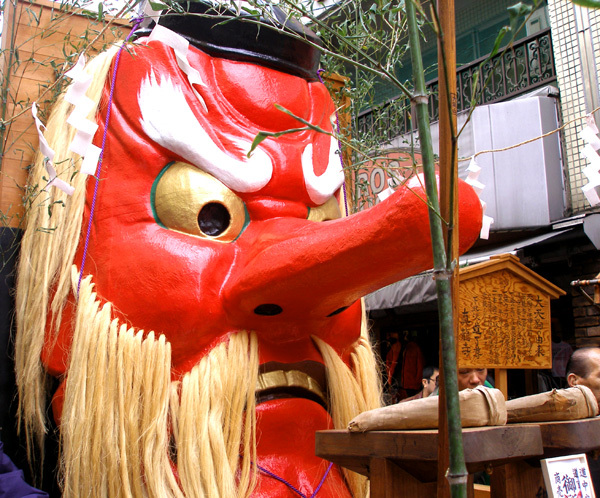 The Tengu is the guardian spirit for the local temple in Shimokitazawa. With him is a Karasu Tengu or Crow Tengu. 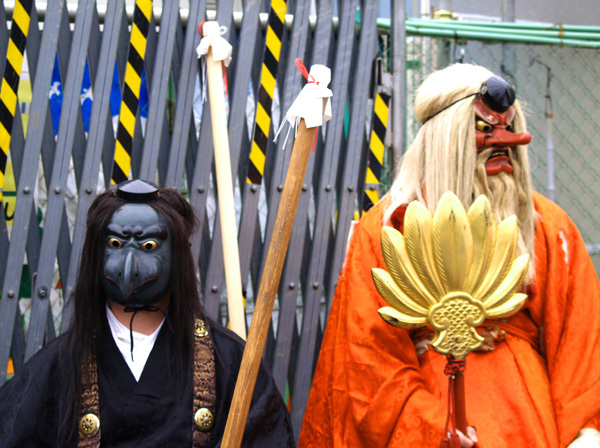 This Tengu has the face of a crow and follows the long nose Tengu. Now at first glance, one might think these two were part of the hoary hordes of devils to be chased away but perhaps the Tengu seeing which way the wind was blowing decided to align themselves with the humans on Setsubun. On the day of Setsubun itself, I started the day early around 9 a.m. heading an hour east of Tokyo to the city of Narita. 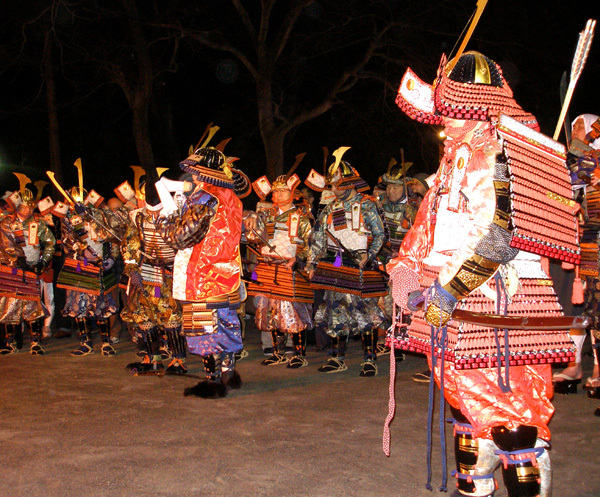 Narita has one of the largest Setsubun celebrations in Japan. 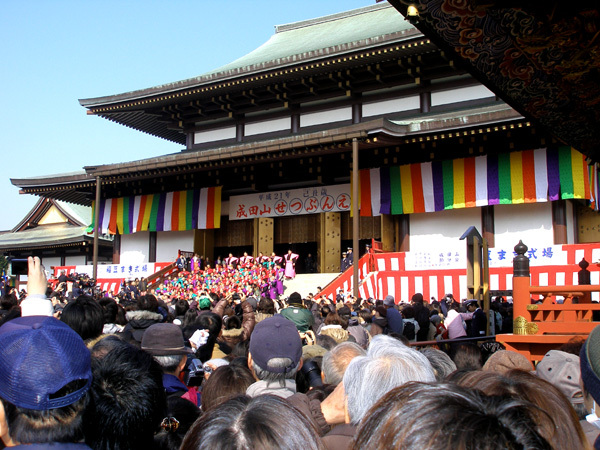 It certainly was the most crowded Setsubun event I had ever attended. A large number of police were there to guide the crowd. Due to the press of people, the police issued a warning to people not to reach for beans that fell to the ground for fear injuries would result. 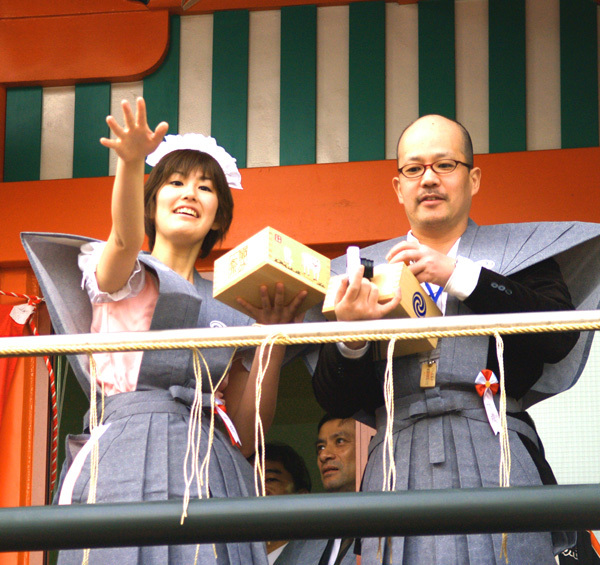 One of the main reasons that Narita draws such a large crowd is their celebrity power. 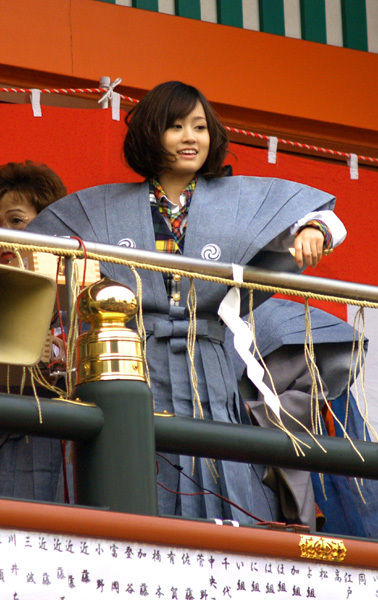 Narita brings out the Yokozuna - sumo champion - and some of the big name celebrities at the height of their popularity. This year, several of the actors of this year's samurai drama were in attendance throwing beans. One of them was former Prime Minister Koizumi's son. I was too far in the back of the crowd to be in any danger of being hit in the face by a strong-armed sumo wrestler (like I was last year) or get crushed by bean-catching crowds. Once the madness had passed, I left Narita and headed back into Tokyo; this time to Kanda Myojin Shrine. I went there last year during a sudden snow storm which I assumed was the work of Setsubun devils since they also represent winter. This year, it was unseasonably warm - perhaps the devils have switched their tactics and are now promoting Global Warming. 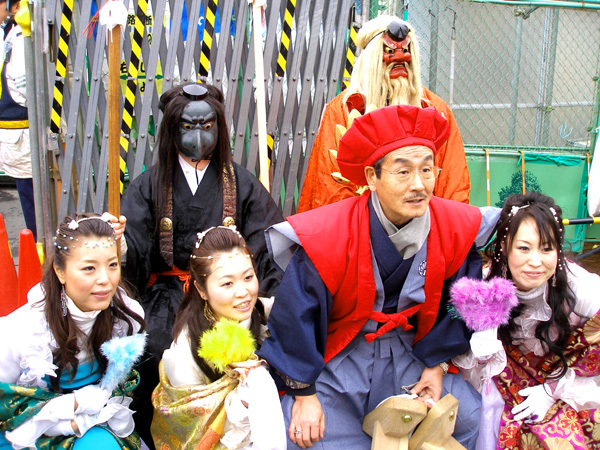 At Myojin Shrine there were also some celebrities such as Dengeki Network and AKB48. Dengeki Network known in English as Tokyo Shock Boys is a comedy stunt troupe known for their extreme and crude acts like lighting fire-crackers in their posterior. AKB48 is a dance idol group based in Tokyo's electronic and anime mecca, Akihabara. They're popular with Akihabara types. Although I got hit in the head with an orange, I still managed to catch a few chocolates at this mame-maki. Afterwards, I headed west towards Nakano in Western Tokyo. Here at a small temple called Hosen-ji I saw once again the small parade of warrior monks which I had first seen several years ago. 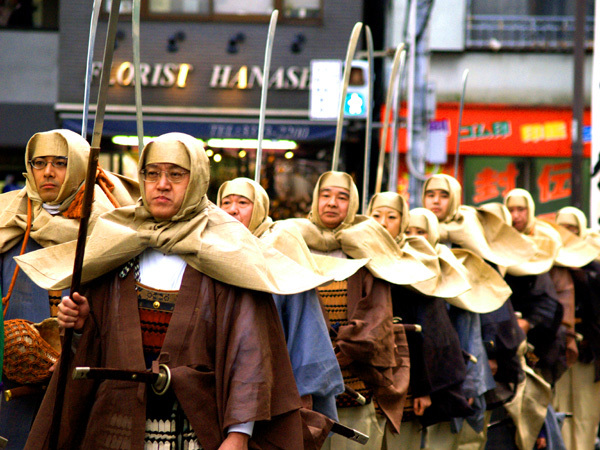 Warrior monks known as sohei were once a troublesome class of Buddhist Priests who used to dispense Buddha's Blessings with the sharp edge of a naginata. They quarreled amongst themselves, with the Imperial Court, and with local Daimyo (warlords). They needled one daimyo so much that he finally decided that enough was enough and promptly set out to burn them out - literally. This was Oda Nobunaga one of the great unifiers of premodern Japan and the site of his vengeance was Enryaku-ji Temple on Mt. Hiei north of Kyoto. In 1571, he razed many of the temples there, killing and burning to death several thousand priests and their families. 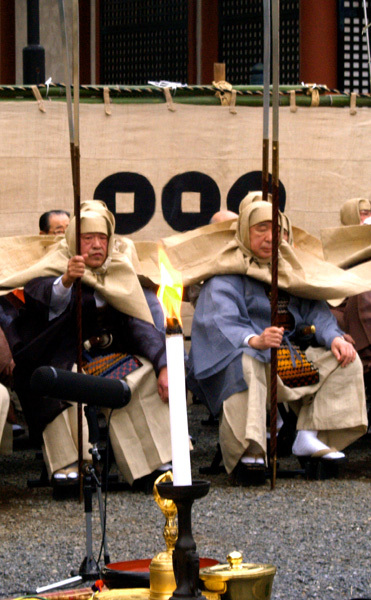 The sohei of Hosen-ji were of milder disposition being that most had seen far too many Setsubun to be of any threat to anyone. 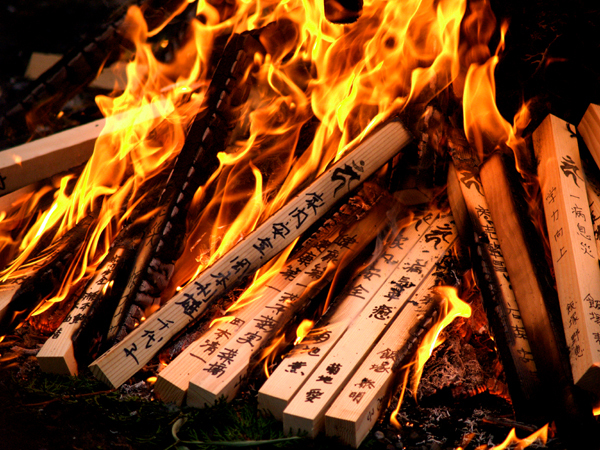 After the aging sohei were seated, a bonfire was lit and prayer sticks were burnt in order to convey their messages heavenward. I did not stick around for the mame-maki session as I had one more place to visit but I did get a spot of sake and an orange for my troubles. I then headed swiftly northwards to the town of Ashikaga in Tochigi Prefecture which is almost two hours outside of Tokyo. 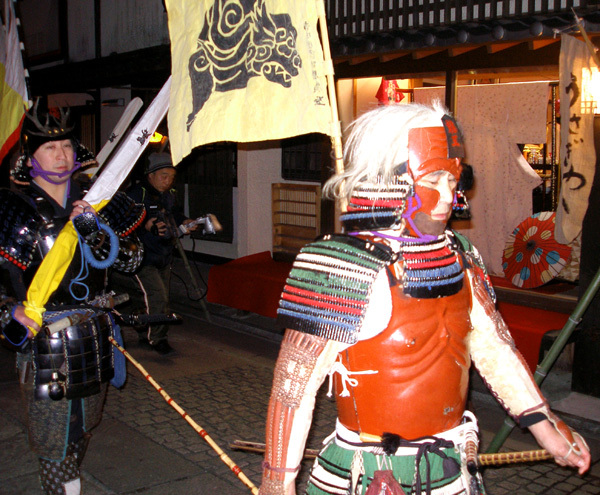 Ashikaga is a small town that was the hometown of the ancestors of the Ashikaga Shoguns (1336-1573). 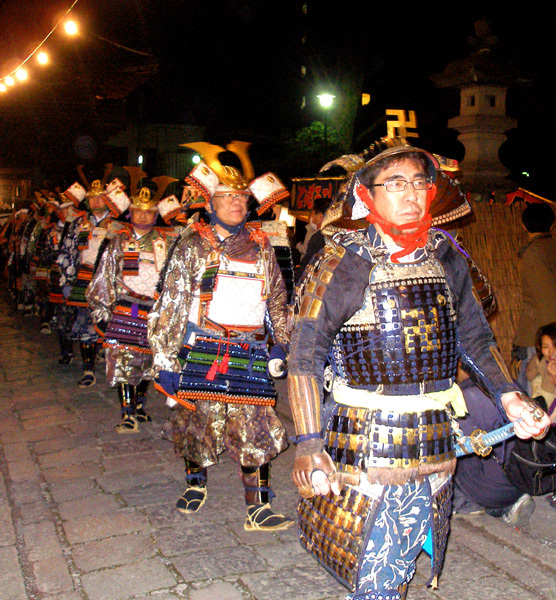 To celebrate Setsubun and their town's past, Ashikaga puts on a procession of armored samurai. The armor covers the time period of the 12th century to the beginning of the 17th century, a time when Japan entered a period of peace known as the Edo Era when armor was no longer a necessity. 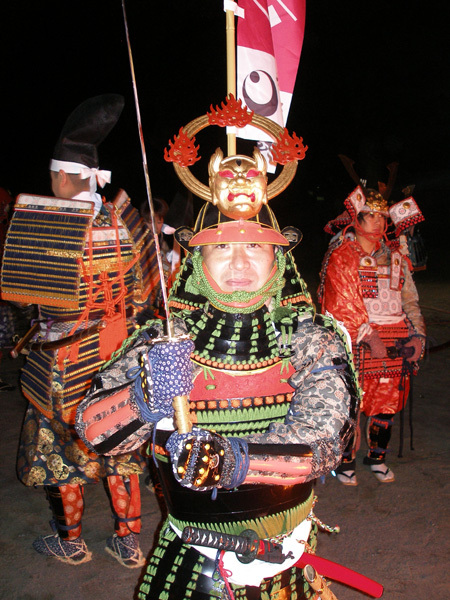 At the local temple, the armored samurai performed a short mame-maki. 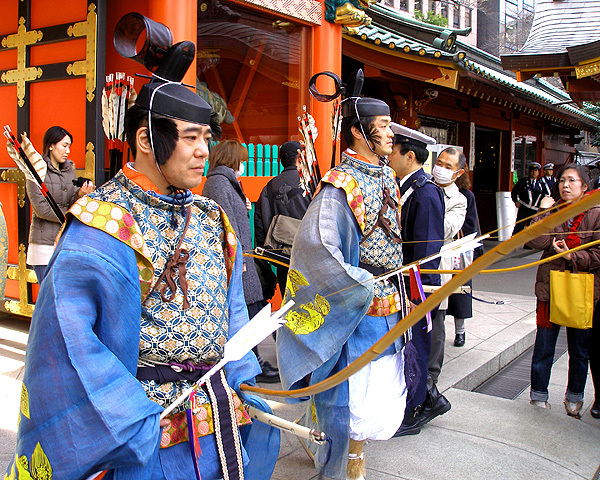 Afterwards, certain samurai went around back to fire their old-style guns. From the mid-16th century when guns were first introduced to Japan by Portuguese traders to the early 17th century, guns played a major role in samurai warfare. 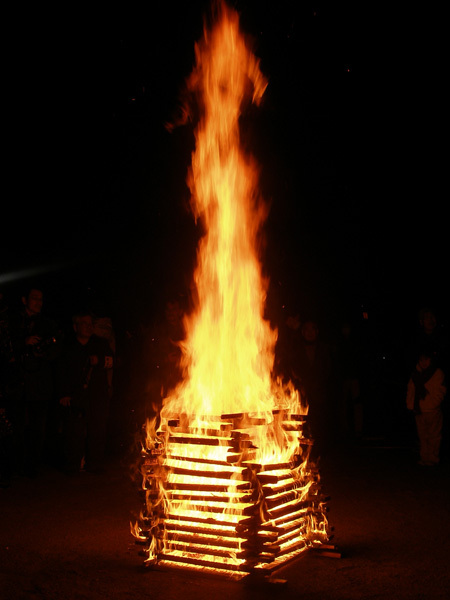 When the shooting samurai had fired their last shot, a bonfire was lit and the all the samurai did a rallying cry. Then the ceremony concluded and with that my long Setsubun finally drew to a close at 9 o'clock at night - but I still had a long train ride back home! The devils of bad luck and winter had been defeated but the devils of sleep were demanding their due and there weren't enough beans to drive them away.